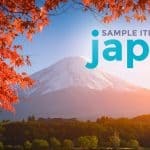 Here are sample recommended DIY OSAKA-KYOTO itineraries for 1 DAY (layover), 2 DAYS (overnight), 3 DAYS, 4 DAYS, 5 DAYS, and 6 DAYS with breakdown of expenses, train pass recommendations, and other travel tips. Kansai is an interesting region to explore especially for first-time travelers in Japan. It has many modern, cultural and historic attractions connected by developed and efficient rail and bus networks, allowing visitors to travel easily and comfortably. The region’s largest city and economic center is Osaka. You’ll easily fill a day’s itinerary just exploring the city. Its most famous district is Dotonbori, where you’ll get to shop till you drop or eat to your heart’s content. There are plenty of local flavors to indulge your gastronomic curiosity. Feel like a child again by going on the rides of Universal Studios, which can take up an entire day. The lines can also be very long depending on the season and day of your visit. The bustling metropolis is where you’ll see old and new collide. Old but restored sites such as Osaka Castle occupy a special place in the city’s beautiful cityscape and skyline. Other destinations in Kansai are easily accessible from Osaka. Kyoto is the most popular. The city has ancient temples that are picturesque and each has a story to tell. Some of these are Kiyomizu-dera and Kinkakuji. Get a glimpse of how royalty lived while exploring Nijo Castle, enjoy nature in Arashiyama and take in the old-world ambiance of Gion. 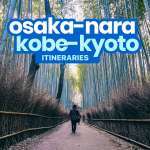 You can also make day or overnight trips in Nara, Himeji and Kobe. In this post, we’ll share with you several sample itineraries that TPT co-founder Yoshke created. You may use these as guides to build your own itinerary. To save money, you can avail of the travel passes for foreigners. These come in day or multi day passes that cover a huge chunk of your travel expenses. Some even provide discounts to famous attractions within the city. There are a lot of them available in Kansai Region. But only the ones listed below are needed for the itineraries in this post. You DON’T need a JR Pass. It’s only wise to use it for trips longer than 7 days with at least 2 long-distance journeys. 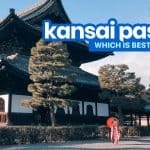 Since the itineraries below are restricted to Kansai region and none of them involve long-distance travels, the JR Pass will be a waste of money here. All itineraries below assume you’re flying in and out of Kansai International Airport. 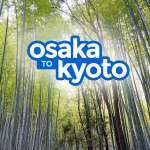 In Osaka, stay at a hotel or hostel in Namba area so you have a direct access to the airport and key attractions. In Kyoto, stay within spitting distance of Kyoto Station. One day is not enough to see the best that Osaka can offer, but if that’s all the time you have, you can still have a grand time. If you want to experience Universal Studios Japan, it can easily take an entire day. For more information, visit: Universal Studios Guide. But if you’re more interested in enjoying the city’s most iconic sites, then the itinerary below is for you. 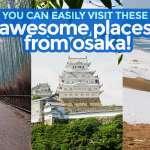 For this itinerary, you will need a 1-day Osaka Amazing Pass. Reserve a Pass Here! Cost Estimate: JPY 6500 (USD58, SGD80, PHP3150, EUR50), excluding airfare. 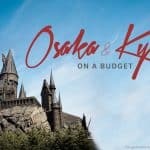 This overnight itinerary will take you to Universal Studios Japan on your first day and to the city’s most famous tourist spots including Osaka Castle, Dotonbori and Umeda Sky Building on the second day. 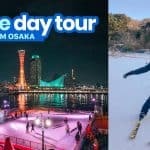 You will need a 1-Day Osaka Amazing Pass for this itinerary, but you should only on your second day. On the first day, just get a regular ticket to ride the train or subway. 01:00pm – Collect 1-day OA Pass, ¥2500, Reserve Here! Cost Estimate: JPY 16500 (USD148, SGD203, PHP7980, EUR127), not including airfare and hotel. This 3-day/2-night itinerary will take you to both Osaka and Kyoto. However, you will be spending both nights in Namba in Osaka. 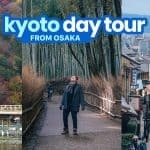 Kyoto will just be a day tour. In Osaka, you’ll be able to visit Universal Studios and key attractions in the city. In Kyoto, you’ll see the thousand torii gates at Fushimi Inari Shrine as well as the Golden Pavilion and Gion District. 1-day JR West Kansai Pass, ¥2200, to be used on Day 3, Reserve Here! Cost Estimate: JPY 23,000 (USD205, SGD282, PHP11120, EUR176), not counting airfare and hotel. Cost Estimate: JPY 29,000 (USD260, SGD355, PHP14025, EUR222), excluding plane tickets and hotel. This itinerary is very similar to the 4-day itinerary above. The only difference is, you will be staying overnight in Kyoto instead of just visiting on a day tour. This way, you get to see much more of what the city has to offer. Aside from the usual tourist spots like Fushimi Inari Shrine and Arashiyama, this itinerary includes a visit to Toei Movie Studio Park, which is a Japanese-style theme park that kids and adults alike will surely enjoy. Cost Estimate: JPY 35,000 (USD313, SGD430, PHP16,900, EUR268), excluding plane tickets and accommodations. Cost Estimate: JPY 38,000 (USD340, SGD466, PHP18,400, EUR290), not counting hotel and plane tickets. If you have more days, we recommend that you visit other cities in Kansai Region like Nara and Kobe. For that, we have a separate post. If you choose to use any of the itineraries above, please take note of these reminders. Book your tickets and passes with Klook. Most of these are discounted. Just follow the affiliate links indicated in the itinerary. It will also help us maintain this blog at no extra cost to you. The indicated budget and times are just estimates. It’s meant to simply give you an idea on how much time or oney an activity can cost. The actual prices and schedules may vary so please double check with official sources. Estimated budget do not include shopping and other expenses not indicated. Total cost projections are overestimated. We gave it a bit of allowance so you have some wiggle room in case of little unplanned incidental expenses. Hi! May I know how is the train commute within the Osaka area? I will be travelling with my husband and our 3yo daughter and my concern is baka too crowded ang mag-train na it will be difficult to travel with kids? 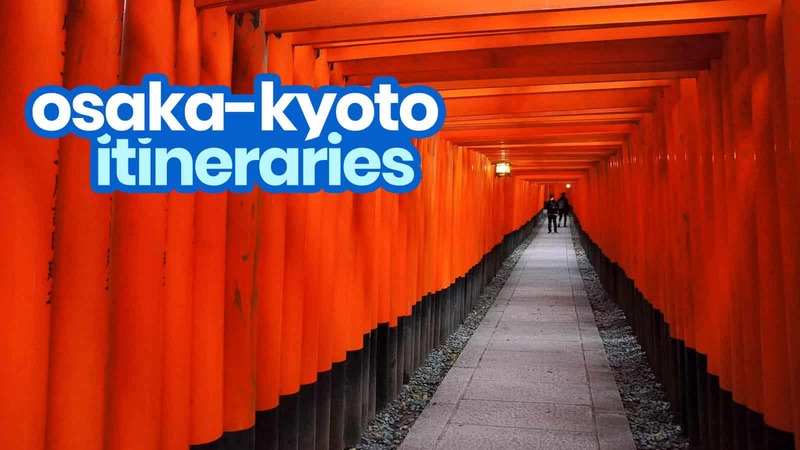 Nice overview, Early april, we will start from Kyoto for 4 days not visitng Arashiyama but Inari, Gion and Philosoph Path then leave to Koyasan for 2 days. Go to Osaka Namba 2 days, leaving to Kansai early morning. from Namba. Do you have a pass covering Koysan? I think Kansai Thru Pass covers Koyasan. Hi Malou, will you also be staying in Kyoto? And what else are you visiting? Will you be visiting Kobe and Nara too? I’ll need much more details to know what passes are great.